A public consultation on whether doctors should be allowed to experiment on dying patients with novel techniques has won huge support from the public. Jeremy Hunt, the Health Secretary, promised to back the Medical Innovation Bill if it was supported by the public. It allows doctors to try out innovative new techniques or drugs on patients, without the fear of prosecution, when all else has failed and they are nearing the end of their life. 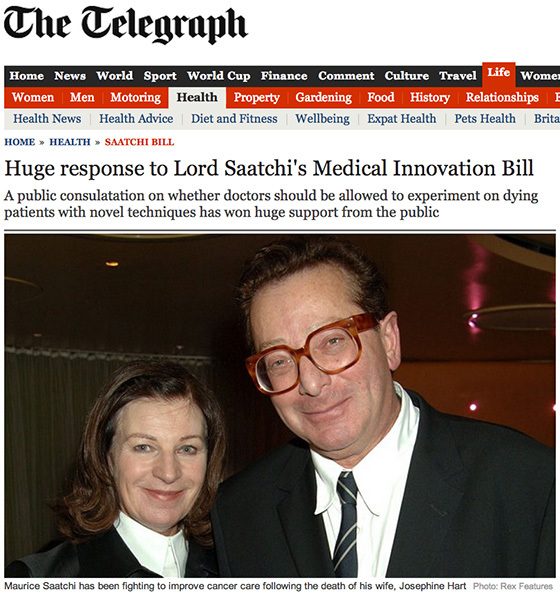 Since the death of his wife, Josephine Hart, to ovarian cancer, Lord Saatchi has campaigned to change the law. A public consultation which has just closed showed overwhelming support for the proposal. It will be presented to the House of Lords on Thursday. So far, more than 18,000 people, including patients, doctors, researchers, scientists and charities – have responded to the supporting the proposals. “It remains true to its original two principles: to give doctors legal clarity and confidence when they wish to innovate, and to stop the quack experimenting recklessly on vulnerable patients. Presently, a doctor who has tried out a new approach can be taken to court and must pass the ‘Bolam Test’ in which other specialists must defend the procedure. However under the new bill, a body of medical experts would decide before the treatment so that the doctor was not left wondering if he or she might appear in court. Sir Bruce Keogh, the medical director of the NHS, has been asked by the health secretary to decide how this would work in practice. He is due to report back this week. “The Bill simply brings the Bolam defence forward – to the clinic – and cuts out the fear of the long, stressful court case, said Mr Nutt. The new Bill has been slightly amended so that doctors cannot carry out untested treatment for research purposes, but only in the best interest of the patient. Lord Saatchi, who introduced the bill in December 2012, said: “Over the past few months, in one of the largest public consultations ever undertaken in this country, the people have agreed that there is a problem with how we are treating some of the sickest in our society. “We have a culture of defensive medicine in the NHS, a culture created by the fear of litigation that hangs over doctors. Last year, the health service paid £1.2 billion in lawsuits.